We know much about malnutrition. Each year it’s to blame for more than 3 million deaths among infants and children. It stunts the growth of 26 percent of all children under age 5. It persists even as families at the base of the pyramid, on average, spend 60 percent of their income on food. We also know effective ways to tackle malnutrition, particularly for the most vulnerable, during the critical first 1,000 days of life and in utero. Yet far less is known about the potential contribution of market-based solutions to reverse malnutrition. A new report by my firm, Hystra, learns from the successes and failures of best-practice organizations that successfully sell nutritious complementary foods and supplements for young children (age 6-24 months) born to BoP families in developing countries. The Global Alliance for Improved Nutrition (GAIN) provided funding for this report as part of its work to improve nutrition for low-income consumers and vulnerable groups. In the report, we do not judge product quality and effectiveness, but instead analyze the marketing and sales approaches of these organizations. It is based on extensive desk research, interviews with 32 experts on nutrition for the BoP, infant nutrition and health-related behavior change, previous Hystra work studying more than 20 models of micro-distribution at the BoP, and analyzing marketing and sales best practices for innovative devices. 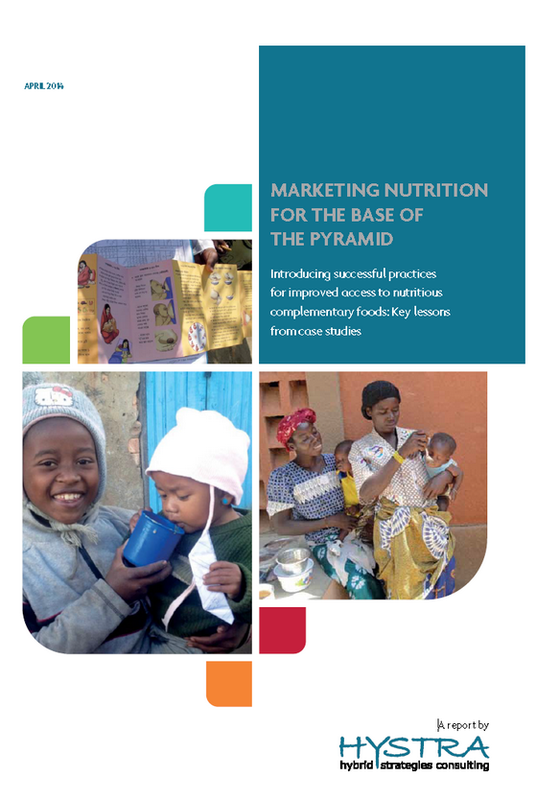 It also provides an in-depth analysis with seven case studies specifically for this work: BRAC-Renata (Bangladesh), Danone Milkuat (Indonesia), Econocom Foods (South Africa), Gret program Nutrifaso (Burkina Faso), Naandi Community Water Services (India), Nutri’zaza (Madagascar) and Protéin Kissèe-La (Côte d’Ivoire). 1. Marketing nutrition is not (only) about health: To succeed, in addition to providing health benefits, products must provide an immediate satisfaction to the child and convenience for the mother, while meeting local food habits. 2. BoP consumers are ready to pay more for nutritious products that they value: Even poor mothers want to give their children the most expensive – seen as the best – food they can afford, not the cheapest product on the market. Hence the challenge is not to lower price as much as to ensure product quality and its health effect on infants in the quantity households can afford. 3. Effective promotion leverages trust and aspirations. Triggering initial trials through health professionals (when in line with local laws), aligning the entire caretaker environment to motivate behavior change and using aspirational (rather than health) messages have proved effective levers to promote these products. 4. Constant reminders and incentives drive compliance, which is key to achieve simultaneously social objectives and economic sustainability for the marketers of these products. 5. In rural and mature markets, traditional retail is the most cost efficient distribution channel: Beyond marketing practices, daily product availability is necessary for regular use and must be achieved at the lowest possible costs. 6. Door-to-door sales can create demand and build client loyalty in new urban markets, or in existing markets where consumers demand services that only door-to-door can provide (e.g., home delivery of ready-to-eat food). 7. Optimizing salesforce productivity requires following private sector best practices for other types of fast-moving consumer goods and innovating “frugally” for distribution solutions (e.g., by leveraging local transportation solutions, such as bikes, motorbikes or carts). 8. Broadening customer base is key to building a sustainable business, i.e., by creating higher margin premium products for richer clients, enlarging the product range with products fit for a larger population than infants and young children or carefully leveraging large-scale institutional orders (distributed for free by public and not-for-profit players). How to establish an evidence-based consensus on the most appropriate nutrition strategies, and in particular, what is the effectiveness of existing fortified products at scale in the medium and long term, in a real life environment where consumption might not be compliant with recommended doses (as opposed to a controlled research setting)? This report highlights some candidate interventions and strategies that could be prioritized as promising interventions on which to concentrate resources to get more evidence of their impact. How can the public health sector best leverage the assets of the private sector to solve the issue of malnutrition? In particular, what is the optimal regulatory environment to promote exclusive breastfeeding and access to high-quality complementary food? How do these multi-stakeholder alliances work for the benefit of the greatest number and to ensure public health impact? How to serve sustainably rural populations who do not have access to packaged goods today. Which models exist to produce adequate nutritious complementary food at home or in the community? How to combine free food distribution in emergency situations with longer-lasting market-based approaches. When are market-based approaches most appropriate and efficient in achieving health objectives? How could the public and private sector better work together to achieve better health impact through improved access to good nutrition? Further research is needed to validate and deepen these findings and explore the above questions. Yet we hope that they can already lead to more large-scale initiatives that leverage market-based mechanisms to bring the benefits of innovative products and services to more families at the BoP, and help solve the scourge of malnutrition. To download the full report and other Hystra reports on marketing for the BoP, energy for the BoP, safe water for the BoP and ICT for the BoP, visit www.hystra.com. Lucie Klarsfeld is a project manager at Hystra. Editor’s note: This post was adapted from an article originally published on Business Fights Poverty.